OU junior Destinee Dickson leads a chant at the "Better Together" march on Thursday, Jan 24, 2019. Hundreds joined the University of Oklahoma’s Black Student Association (OU BSA) Thursday afternoon in a march across campus after a video of a person wearing blackface near campus surfaced Jan 23. This is the second such incident within a week. Another video of a student in blackface using a racial slur began circulating Friday, Jan 18. The “Better Together” marchers linked arms and walked silently to the student union. Some held signs. 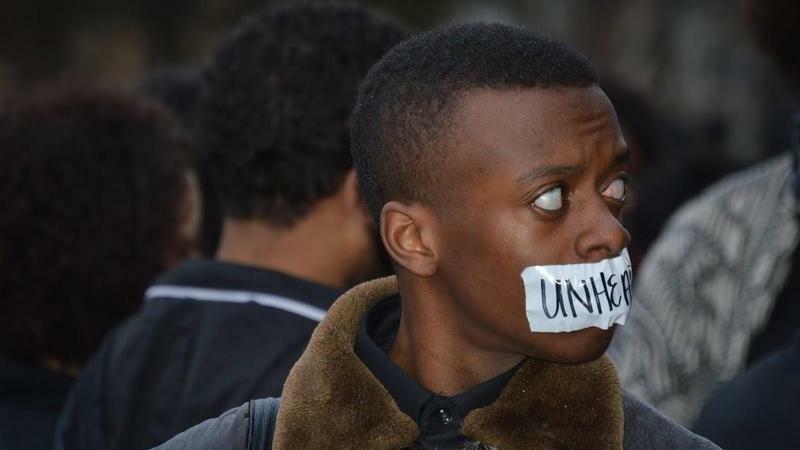 Others wore tape over their mouths bearing the words #StillUnheard. Inside the building, Destinee Dickson, a junior, used a megaphone to chant, “What do we want?” “Justice!,” the crowd yelled back. The march continued to OU President James Gallogly’s office where student Miles Francisco announced OU BSA had delivered a list of demands. Following the first blackface video, OU BSA released a statement demanding the administration to add a “zero-tolerance policy of hate speech” to the university’s student conduct code, create curriculum “dedicated to the education of social and cultural competency for all students,” increase “multicultural” faculty and staff and put more resources toward programs for African American students. Gallogly was criticized for his initial response to the first video. He and interim Associate Vice President of the Office of University Community Jane Irungu released a statement the same day news of the first video broke. “The University of Oklahoma abhors such conduct and condemns the students’ actions and behavior in the strongest terms possible. While students have the freedom of expression, the negative impact of such conduct cannot be underestimated,” it read in part. The statement also noted the two students involved in the initial video, Olivia Urban and Frances Ford, offered to apologize. OU released their apology letters on Tuesday morning. "On the night of Jan. 18, I made the most regrettable decision of my life. I went against my common knowledge and disrespected a community I love,” wrote Urban. “I’m deeply sorry to the individuals, families, and communities that I hurt. My heart hurts to see the traumatic impact my words and actions have had on those who have been hurt of my behalf. There is no excuse for this behavior, in private or in public. My intent was not to hurt, diminish, or degrade anybody inside or outside the OU community… and hope to learn from my mistake." In a press conference a day earlier Gallogly said he will consider revising the student code of conduct and make efforts to recruit more students, faculty and staff of color. No concrete plans have been announced. But the students’ apologies and Gallogly’s words did little to quell frustration on campus. Many gathered Tuesday evening for an event called the Rally To End Racism, where tensions flared. Professor Suzette Grillot called for Gallogly’s resignation, and others expressed disillusionment with campus culture. Assistant Professor Dr. Mirelsie Velazquez read the same speech she says she gave in 2015, after a video of Sigma Alpha Epsilon members singing about lynching made national headlines. "I am not reading anything new," Velazquez said, "and I'm going to keep this ready. Because this is not about the video that surfaced recently. It's about everyday experiences here on campus and on campuses across the country." Miles Francisco, one of the students leading Thursday’s march, expressed similar thoughts. OU BSA says it has created an emergency response team to address instances of racism on campus. This Week in Oklahoma Politics, KOSU's Michael Cross talks with ACLU Oklahoma Executive Director Ryan Kiesel and Republican Political Consultant Neva Hill about the State House and Senate agreeing to send the governor a $474M tax increase to fund pay raises for teachers, school support staff and state workers. Meanwhile, the Board of Corrections calls on lawmakers to provide $9M in supplemental funds just to pay bills over the next three months. 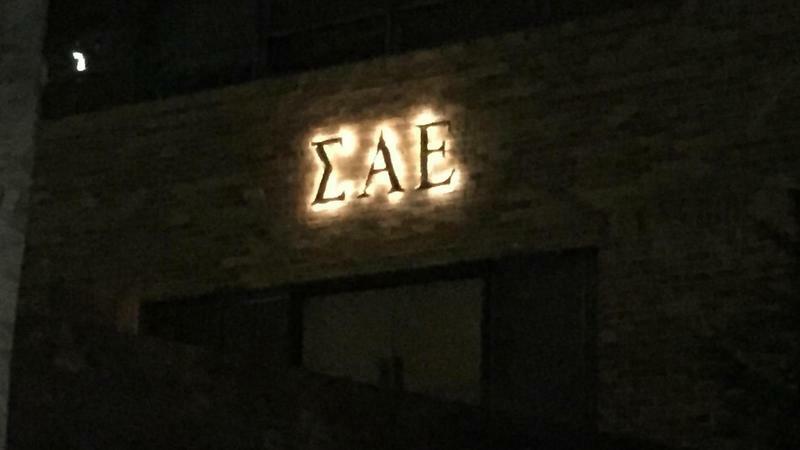 Responding to a video that allegedly shows members of its University of Oklahoma chapter chanting racist slurs about African-Americans and lynching, the national office of the Sigma Alpha Epsilon fraternity has closed the chapter and suspended its members. The video reportedly captured a scene of members of the fraternity, dressed in formalwear, chanting slurs as they rode on a chartered bus. It surfaced Sunday, immediately drawing wide condemnation for the chant's mention of lynching and the promise that the fraternity will never have a black member.